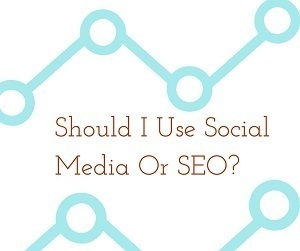 At Design & Promote, as a Chicago Internet marketing firm, we get asked the following question a lot: Should I do SEO or Social Media to promote my business? The answer is: Both. In this post, we’ll cover some key differences. No matter what size and scope of your business, working with a Chicago Internet marketing firm can instantly help your company generate consumer buzz as well as effectively drive traffic to your business site. Before working with us, many of our partners initially struggled with identifying the advantages and limitations of both search and social media. Many entrepreneurs find themselves struggling to decide which one makes the most sense for their business. We don’t recommend only choosing one of these strategies. Having a comprehensive range of resources can help companies employ both SEO and social media to yield results. There are distinctive differences between search (SEO) and social media. SEO is a form of inbound marketing. Social media is a way to gain deeper connections with your customers. And together, they make the perfect blend. Search engine optimization (SEO) focuses on getting your business links at the top of browser searches organically. SEO is like inbound marketing. Why is this important? Because using search engines to find services/products is the most popular way for consumers to find products and services. No matter what your offerings, chances are, potential clients will find you through keyword searches on Google, Yahoo, Bing and/or other search engines. Raking well in those browsers requires an SEO strategy for your business that is based on researched, validated keyword phrases to help your links rise organically to the top of search results. Of course, sometimes organic (aka free) strategies aren’t enough to catapult a business ahead of the competition. There are also various paid search strategies that can be included to give your business the extra promotional boost. Pay-Per-Click is an example of a paid search listing. SEO can certainly result in impressive results, but it’s critical not to discount the value of including social media methods as well. What’s one of the biggest perks that social media offers business owners? Opportunities for closer connections. It offers your network ways to discover and build more connections. For instance, LinkedIn offers businesses the chance to pull recommendations from followers in their own personal network. These “warm referrals” have proven an invaluable way to steadily expand the reach of a brand and increases the likelihood of followers converting to buyers. Another advantage of getting social with your online marketing strategies is that you’ll have virtually real-time access to what consumers are saying about your brand. Embrace the positive feedback, but more importantly, respond promptly to negative commentary to establish your business as a brand that cares. Just like SEO, social media also offers its own set of paid advertising options. For instance on Facebook, creating highly targeted ads, if crafted smartly, can yield some nice results. Smart advertising on social media can go way beyond hitting “boost this post” on Facebook. Want to hear more about how Design & Promote can customize an online marketing solution for your business using both search and social media strategies? Visit our website today!